This is old version TuneIn Radio 15.9 apk for Android, you can install it if you want to downgrade or install old app. It is top Music & Audio apps from TuneIn Inc. If you select the in-app purchases, the TuneIn Radio is going to give you premium content version. The content includes commercial-free music from more than 600 radio station over the globe. The premium version is going to remove banner ads from your screen as well. Moreover, you can gain access to more than 40.000 audio books. 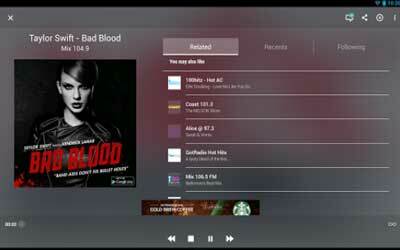 So far, more than 100 million users have downloaded this radio application. Most users say that this app is considered as the best app you can found on Google Play Store. They appreciate both local domain feature as well as the live broadcast feature. Generally, this app allows you to listen your favorite radio channel all over the world for free. When you are travelling far away from your town, this app is going to give you streaming radio channel from your hometown. TuneIn Radio for Android is recommended for those of you who enjoy streaming and listening radio channel. Live coverage of every NFL, MLB and NHL game. Stream your favorite AM/FM radio stations live including ESPN Radio, NPR, CNN, BBC, WFAN, & CBS Radio. Follow college basketball all season long on TuneIn with live play-by-play coverage from 95 Division 1 basketball teams including Kansas, Maryland, Duke, Villanova, SMU, West Virginia, and Kentucky. Listen to your favorite talk shows and podcasts like The Rush Limbaugh Show, The Steve Harvey Morning Show, and WTF with Marc Maron.